It was bus work for me most of the morning and into the afternoon on Tuesday. We moved to an RV Park on Monday and arrived in the middle of a raging wind storm. We heard a loud POP on the roof and we all said, "That was a different noise!" BoggsMobile noises make me nervous. The different noise was the roof vent lid that is over the shower. The wind ripped it open, breaking it free from the metal bracket inside and shattering the plastic lid. In a few moments it was broke into a hundred thousand pieces. I was not about to get up on the roof in 30 MPH sustained winds unless I absolutely had to do it! Since it was not raining and nothing else was in danger of breaking, I stayed on the ground. Early Tuesday morning I went up and removed what was left and took a picture of the model information. I could have ordered a lid online but I wanted to make sure I was getting the correct one so I went to Camping World about 20 minutes away. They had exactly one in stock, so I bought it. It only took a few minutes to put it on. While I was up there I checked the AC covers and made sure they were all secure. I do not have the best success with AC covers so I thought I might as well check. I also snapped a picture of the RV Park. I wanted you to see what a desert RV Park looks like. While I was out, I stopped at the ATT store to add minutes to Bro. Shobanke's US phone. He should be in the US by Friday and Kelly Jo mailed the phone to his first stop in Iowa. I do not know if our paths will cross on his visit this year but we certainly hope so. Tuesday evening Kelly Jo and I met Pastor Noah and Sis. Carla Martinez for a nice meal out. We really enjoyed the fellowship with our dear friends. The Martinez family are really great people and we are thankful to have them in our lives. We have enjoyed our time with them while in City Reach. We should get to see them again tomorrow at Bro. Johnson George's church. Speaking of Pastor George, I have a flyer they created for our revival there. We are very thankful for God putting us together with Pastor Johnson George and his wife. 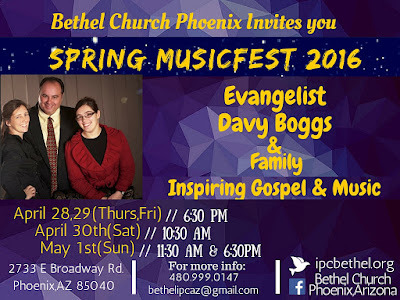 They are wonderful people of God and we appreciate the open door they have extend to us at Bethel Church in Phoenix. 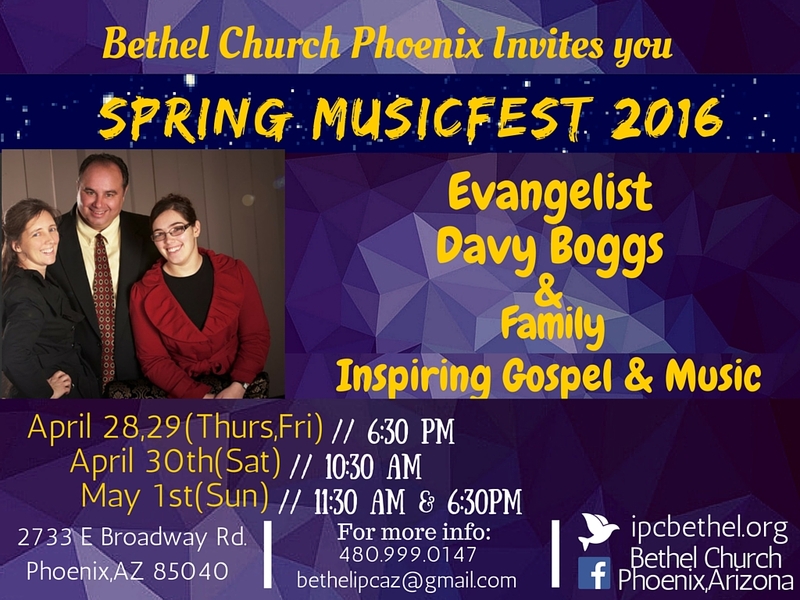 We will be singing and preaching Thursday night, Friday night, Saturday morning and both services Sunday. After we finish in Phoenix we will hurry off to Atwater, California to begin City Reach Tent Revival in Atwater, California. Pastor Jared Burris has received the final permission to set up in the city park and we are thrilled about that. We are expecting God to meet with us in powerful services as He saves, heals and delivers. Please pray for these meetings and come be with us if you can possibly do it at all! We would love to have you.